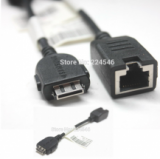 The Hiperdeal HDMI Aux jack splitter is the 5-ft long cable adapter for RCA. The HDMI cable splits into RCA AV composite. It is able to send out high-resolution video signal with better stability. It is compatible with DVD player, TV, Projector, HDTV receiver or other HDMI outfitted device. Just hit order now.